Aicardi syndrome is a rare disorder. 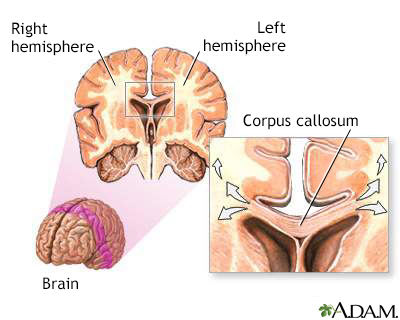 In this condition, the structure that connects the two sides of the brain (called the corpus callosum) is partly or completely missing. Nearly all known cases occur in people with no history of the disorder in their family (sporadic). The cause of Aicardi syndrome is unknown at this time. In some cases, experts believe it may be a result of a gene defect on the X chromosome. The disorder affects only girls. Symptoms most often start when the child is between ages 3 and 5 months. The condition causes jerking (infantile spasms), a type of childhood seizure. Aicardi syndrome may occur with other brain defects. In rare cases, one of these features may be missing (especially lack of development of the corpus callosum). Other procedures and tests may be done, depending on the person. Treatment is done to help prevent symptoms. It involves managing seizures and any other health concerns. Treatment uses programs to help the family and child cope with delays in development. The outlook depends on how severe the symptoms are and what other health conditions are present. Nearly all children with this syndrome have severe learning difficulties and remain completely dependent on others. However, a few have some language abilities and some can walk on their own or with support. Vision varies from normal to blind. Complications depend on the severity of symptoms. Call your health care provider if your child has symptoms of Aicardi syndrome. Seek emergency care if the infant is having spasms or a seizure. Beres S. Aicardi syndrome. American Academy of Ophthalmology website. www.aao.org/pediatric-center-detail/neuro-ophthalmology-aicardi-syndrome. Accessed August 19, 2018. Samat HB, Flores-Samat L. Developmental disorders of the nervous system. In: Daroff RB, Jankovic J, Mazziotta JC, Pomeroy SL, eds. Bradley's Neurology in Clinical Practice. 7th ed. Philadelphia, PA: Elsevier; 2016:chap 89. US National Library of Medicine website. Aicardi syndrome. ghr.nlm.nih.gov/condition/aicardi-syndrome. Updated September 20, 2016. Accessed August 19, 2018.